Fabric's Tool Keg integrates with their cage-less bottle mount system so you can sacrifice a bottle for the convenience of additional, easily-accessible storage. 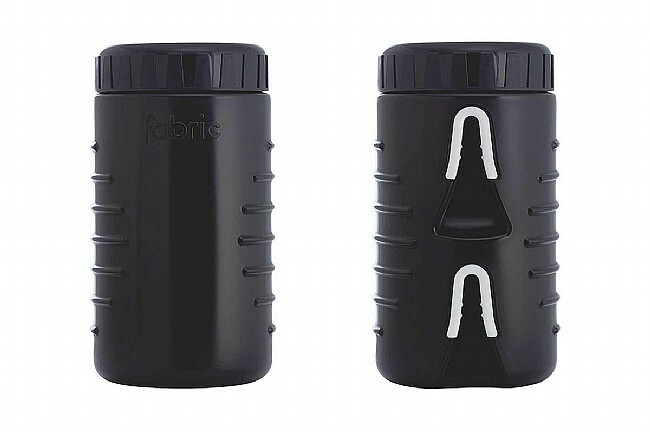 It includes the same specialized bolts, which slide securely into slots on the outside of the Keg to hold your supplies without the unnecessary bulk and weight of a bottle cage. It's made from durable BPA-free plastic with a watertight lid for protection from the elements, and inside, there's 600 mL of storage for tubes, tools, or extra snacks. It even includes a neoprene sleeve that you can use to keep small parts together or keep things from bouncing around while you're riding. Includes neoprene sleeve and proprietary mounting bolts. Also fits in most standard water bottle cages. 600 mL capacity. BPA-free. The plastic material is much stronger and more durable than a typical water bottle, plus the drawstring sleeve that's included helps keep the noise down. It was easy to install with the bike mount hardware and so far has been really secure. It's a bit bigger than other tool kegs making it too wide to fit directly into some water bottle cage. The downside here is that you need the Fabric hardware on every bike you own, so if you plan to move it from bike to bike, it's tough to do that with bottle cages. Was awesome until it wasn't. The tool keg performed great for me on a mucky graveltrail ride recently, kept everything dry, out of the way, and easy to access to help a friend in need of a quick repair. Finished a gravel ride today and the tool keg was gone at the end of the ride. Disappointment. It was securely attached but dislodged on a very bumpy descent. Takeaway is that this products is ideal for smoother surfaces and not the rough and tumble. 3 stars because I like the concept as long as it's the right terrain. Would have been 5 stars yesterday. I wanted to move my spare tube and tools from a seat bag down to the bosses under my down tube. This goal was accomplished with the Fabric Tool Keg. The keg seats securely and attaches and detaches cleanly. The cylindrical shape constrains capacity, the tube takes up most of the available space. It's nice that the keg comes with a fabric liner, but I had to remove it just to hold the tube, a couple of tire irons, and a multi-tool. Since everything is so jammed in there, the contents don't shake around anyway, so the liner isn't needed.